Photo by David van Mill. 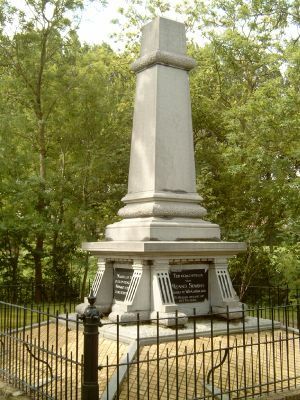 The Menno Monument (coordinates: 53° 5' 56" N, 5° 28' 54" E [53.098889, 5.481667]), in Witmarsum, Dutch province of Friesland, was erected on the site where the meetinghouse of the Witmarsum Mennonites once stood. Tradition says that the house of Herman and Gerrit Jansz stood here, where Menno first preached after leaving the Roman Catholic Church in 1536, and often stayed, and where he was probably married. These traditions are, however, rather improbable. The monument, a large stone obelisk about 10 feet high, was dedicated on 11 September 1879. On the front it has the words, "In memory of Menno Simons, b. at Witmarsum in 1496. Heb. 12:7"; on the left side: "According to tradition Menno preached to his first followers here"; on the right side (facing the village two miles (3.3 km) distant): "For three centuries the Mennonites of Witmarsum assembled at this place"; on the back: "I Corinthians 3:11. 1536." The petition of the Dutch Mennonites for contributions to support the project was not universally complied with. Christian Schmutz of Rappenau (Baden) and others rejected the idea of such a monument. The stiffest resistance was encountered in America, where an article in the periodical Zur Heimath called it idolatry and a defamation of Menno Simons. On 3 July 1936 in connection with the close of the Mennonite World Conference, a wreath was placed at the foot of the monument in a solemn ceremony. Hege, Christian and Christian Neff. Mennonitisches Lexikon, 4 vols. Frankfurt & Weierhof: Hege; Karlsruhe: Schneider, 1913-1967: v. III, 94 f.
Mennonitische Blätter (1878): 22, 55 ff. ; (1879): 63; (1880): 37; (1907): 81. Neff, Christian. "Menno Monument (Witmarsum, Friesland, Netherlands)." Global Anabaptist Mennonite Encyclopedia Online. 1957. Web. 22 Apr 2019. http://gameo.org/index.php?title=Menno_Monument_(Witmarsum,_Friesland,_Netherlands)&oldid=144384. Neff, Christian. (1957). Menno Monument (Witmarsum, Friesland, Netherlands). Global Anabaptist Mennonite Encyclopedia Online. Retrieved 22 April 2019, from http://gameo.org/index.php?title=Menno_Monument_(Witmarsum,_Friesland,_Netherlands)&oldid=144384. Adapted by permission of Herald Press, Harrisonburg, Virginia, from Mennonite Encyclopedia, Vol. 3, pp. 576-577. All rights reserved.